Summer open-air theatre played on the square in front of the Einsiedeln abbey. 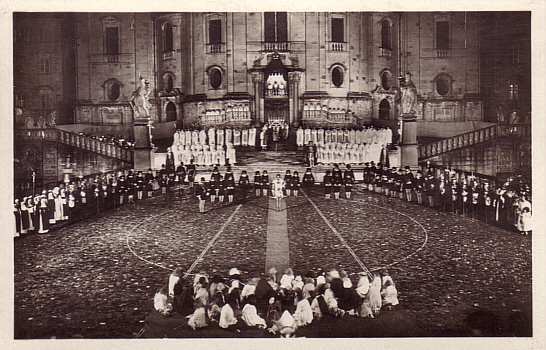 Premiere with Calderón de la Barca's "El gran teatro del mundo" ["Welttheater"] on 15 Aug 1924. Again played in the summers of 1925, 1930, 1935, 1937, 1950, 1955, 1960, 1965, 1970, 1981, 1987, 1992, 2000, 2007, 2013, 2020. Reverse Text: "Welttheater Einsiedeln 1930 - Offizielle Postkarte"